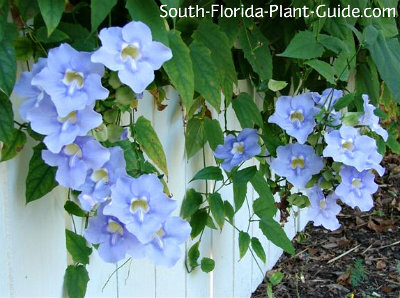 Fast growing sky vine reaches for the sky, decorated with ravishing summer flowers in blue with a hint of violet. 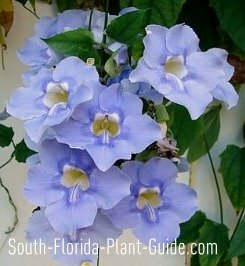 Blue flowering plants are a rarity in South Florida, and this vine's incredibly beautiful clusters of blue-violet blooms light up the landscape with their unusual color and sheer size. This is one fast-growing vine...like the famous bunny, it keeps going - and going - and going. You'll need plenty of room to fit one into your yard, but it can quickly fill in the blanks on an empty fence with just one or two plants. These vines will climb over anything in their path, sending out wandering tendrils that can reach several feet out and grab onto a tree branch. Deep green spade-shaped leaves form thick dense foliage, and the exquisite bloom clusters make fantastic cut flowers for your home, something we don't take enough advantage of here in South Florida. These vines blossom summer through fall. They need the warmth of Zone 10 and even there can defoliate in a cold winter. 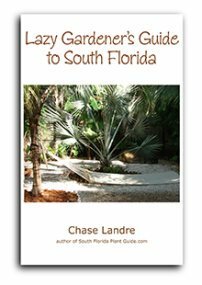 This vine will grow in full sun but stays greener and prettier with a little shade protection from the blazing afternoon sunshine. You must allow plenty of room for this rampant grower. 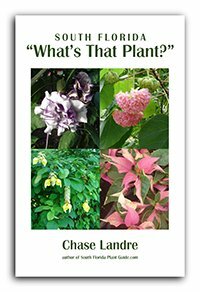 Plant 8 feet from trees and shrubs. To use along a fence, space vines 5 or 6 feet apart...or more. Amend the soil with top soil (or organic peat moss) and composted cow manure added to the planting hole. 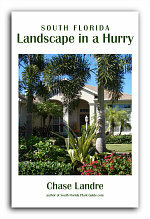 Fertilize twice a year - in spring and fall - with a good granular fertilizer. Supplement feedings during warm weather with bone meal and/or liquid fertilizer to promote heavier flowering. Cut back hard in early spring - mid to late March.